About Turn Logistics was established to provide a comprehensive range of International Courier, Airfreight, Sea Freight and various Domestic Services. The company focus is on tailoring services to meet specific client needs and requirements as opposed to seeing all clients as a “one size fits all” package. 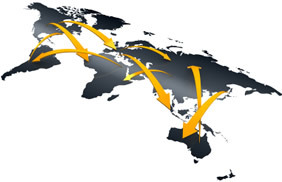 Clients benefit directly when dealing with About turn Logistics as we buy a destination specific international rate and in turn pass on this cost saving directly to you, our valued client. The ability to select service providers according to standards and variations in different regions both internationally and domestically provides our clients with unrivalled service standards to all delivery areas. About Turn Logistics are constantly striving to improve and we have recently updated our online tracking facility, please make use of the link provided to track the progress of your consignment.